Stanford Advanced Materials provides scientific chemical spectrophotometers to keep your lab up to analysis standards. 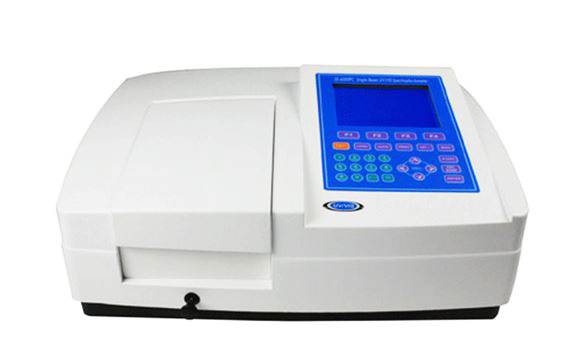 We offer Single Beam UV-Vis Spectrophotometer, Double Beam UV-VIS Spectrophotometer and Flame Photometer to meet your various needs. We also provide lab instruments like Ductless Fume Hood, Laboratory Ultrasonic Cleaner, etc. A spectrophotometer measures either the amount of light reflected from a sample object or the amount of light that is absorbed by the sample object. A single beam machine can measure a wider range of light frequencies compared to double beam spectrophotometer. Our single beam UV-Vis spectrophotometer has low stray light (below 0.05%T). LCD display and large data memory space are available. Our lab spectrophotometers are safely packaged with double cartons. They are clearly tagged and labeled externally to ensure efficient identification and quality control. Great care is taken to avoid any damage which might be caused during storage or transportation.